Wesley Schneider formally bowed out as an Oranje international with a 2-1 win in a friendly against Peru on Thursday evening. Memphis Depay scored both Dutch goals. Sneijder announced his retirement in March after an international career spanning 15 years and a record 133 caps but was given last night’s game to say farewell to fans. The 34-year-old, who currently plays for Al Gharafa in Qatar, took to the pitch wearing the captain’s armband and was substituted after 100 minutes. 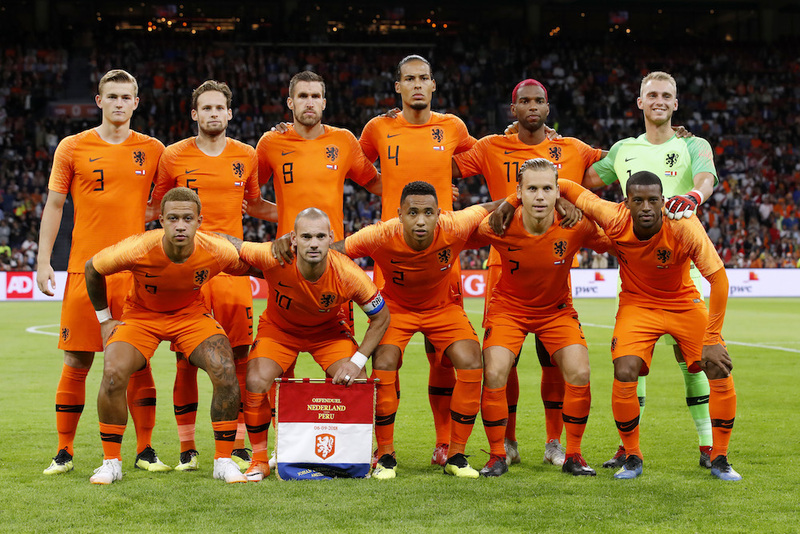 Oranje captain Virgil van Dijk said in a post match press conference that Sneijder will be sorely missed, due to his personality as much as his qualities as a player. ‘He was incredibly important for the atmosphere,’ Van Dijk told reporters after the game. ‘He pepped people up if they needed it. Now other lads will have to take over… He is a great player with a fantastic career behind him. It is an honour to have played with him. Sneijder made his debut for Oranje in a friendly match against Portugal in April 2003, less than two months after breaking into Ajax’s first team as an 18-year-old. His real breakthrough came in November that year when he masterminded a 6-0 win against Scotland in the second leg of the play-offs for Euro 2004, after the Netherlands had lost the first leg 1-0. Sneijder was the linchpin of the team that reached the 2010 World Cup final, scoring five goals from midfield to become the tournament’s joint top scorer. Four years later he won his 100th international cap as the Dutch shocked world champions Spain in their opening World Cup match, winning 5-1 on their way to the semi-finals. As an Ajax player Sneijder won the league title in his debut season and the KNVB Cup twice before being sold for €27 million to Real Madrid in 2007. Two years later he joined Inter Milan, where he was instrumental in winning the treble of league, cup and Champions League in the 2009-10 season. He later spent five years at Turkish club Galatasaray before buying himself out of his contract in July last year and moving to Qatar.